For nearly a century the towering letters of the Bemis Company sign have dominated the skyline just south of Pioneer Square, marking the edge of Seattle’s industrial district. Erected in three phases over a fifty year period, the massive five story, 150,000 square foot factory building mirrored Seattle’s industrial growth during the first half of the century. 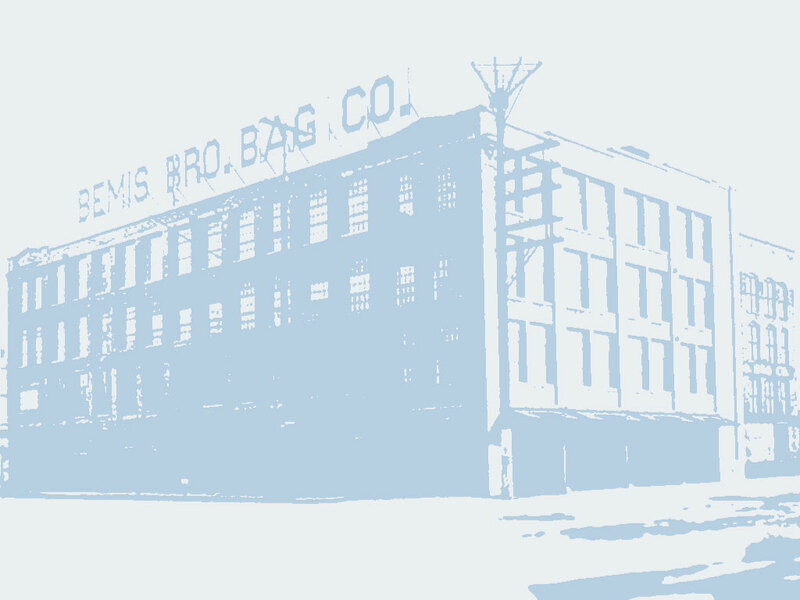 Judson Moss Bemis founded the company in St. Louis three years before the Civil War, cutting and fabricating cloth and burlap bags. 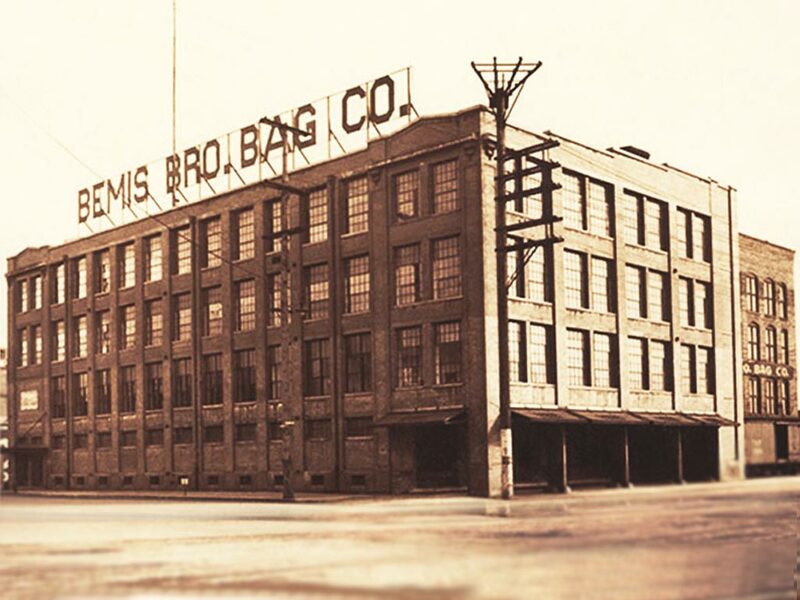 Bemis revolutionized an industry that always produced hand sewn bags. As the durability of the machine made product gained acceptance the company expanded rapidly. In 1903 Robert McAusland traveled west by train soliciting orders. 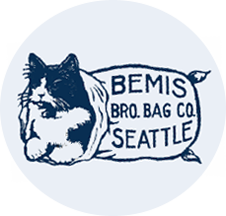 It is said that he managed to sneak a desk aboard a box car shipment of bags and upon it’s arrival promptly rented Bemis’s first office space in Seattle at the corner of 1st and Madison for five dollars a month. As orders steadily increased, McAusland received approval to construct a new plant in 1904. Construction was typical of the era consisting of post and beam heavy timber framing with exterior brick masonry. The Seattle facility became the ninth in what would eventually grow to a group of 28 factories producing a wide array of products. By 1915 the plant could no longer keep up with the demand for its burlap bags, used widely in export and trade markets; expansion was imminent. Records show that the company investigated other tracts of land including recently filled in tidelands to the south near what is now the Sears/Sodo Center, but decided to add on to the existing facility. In early 1916 noted Architect and Engineer A. J. Widmer was sent west from St. Louis to design the new plant. The imposing four story brick facade facing downtown was completed in 1917, more than doubling the size of the original factory to 115,000 square feet. Widmer designed an incredibly solid structure with massive concrete support posts and seismic reinforcement, which was well ahead of its day. Plant production was expanded to include cotton and eventually paper bags for an ever-expanding range of uses. The huge presses ran round the clock and demand continued to increase. In 1946 two earthquakes weakened the walls of the original plant building, bringing down the roof mounted water tank. The 7.1 Richter quake of 1949 that wreaked havoc throughout Seattle also collapsed a section of the old south wall at Bemis, while the massively constructed 1917 addition “Never lost a brick” to quote the local press. To rectify the damage Bemis expanded again in 1949-50 demolishing the walls of the 1904 building, extending the perimeter 20 to 40 feet and constructing a new seismically reinforced concrete addition. The plant continued operation, employing as many as 450 workers running 3 shifts, and expanding its product line. 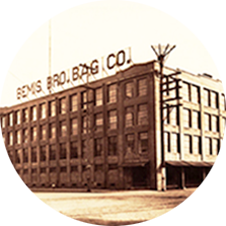 By 1990 The Bemis Company had grown to a large international corporation with 28 production plants and annual sales in the billions. The Seattle plant had become too small and outmoded for the needs of the company so plans were made to consolidate operations with the Vancouver, Washington plant. In mid 1993 the presses and machinery fell silent and their removal was initiated. The vacant building represented a serious challenge for any developer. Its multi-story post and beam construction and restricted truck access rendered it obsolete as a contemporary manufacturing facility. Its shear size and industrial zoning made most development options difficult and expensive. 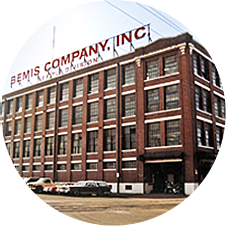 In 1994 a group of four investors headed by Seattle artist David Huchthausen reached an agreement with the Bemis Company to purchase the property. Huchthausen, a Fulbright Scholar and former University Professor, is best known as a major force in contemporary glass. His intricately fabricated sculpture is found in the permanent collections of over 60 major museums worldwide including New York’s Metropolitan Museum of Art and the Smithsonian Institution in Washington D. C.
A staunch advocate of historic preservation, Huchthausen has an extensive background in architecture. He has been active in Seattle real estate since 1985, renovating numerous older buildings. For the Bemis renovation Huchthausen designed a mixed-use development, incorporating warehouse, light manufacturing and offices on the lower levels with 30 residential artist lofts on the top two floors. The 30,000 square foot floor plate permitted 10 foot wide hallways and large units ranging from 1300 to 3000 square feet. Ceiling height is constant at 12.5 feet on the third floor and ranges from 12 to 17 feet with clerestory skylights on the fourth. All lofts in the 1917 brick section of the building provide panoramic views of Downtown Seattle. Overhead beams remain exposed with interior demising walls constructed between existing posts, retaining the industrial “feel” of the spaces. All units have large bathrooms, full kitchens with hardwood cabinets, gas ranges, and steam heat throughout the building. The original steel sash windows were replaced with thermopane panels incorporating interior grids to match the look of the original factory windows. This maintains the historic integrity of the building, which is currently on the city’s study list for landmark designation. 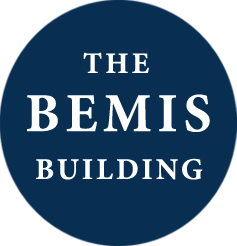 In spite of the background and experience of those involved in the project including architect Kevin Broderick and venerable engineer William Schaible (Pike Place Market and State Capitol seismic retrofits), the Bemis Building presented incredible technical, political and financial obstacles. Despite substantial capitalization and exhaustive economic studies of the conversion, all major local banks initially rejected the project. Recognizing the tremendous potential for growth in south downtown, Washington First International Bank structured a loan for the project. Huchthausen and his associates negotiated with the Seattle Building Department for six months prior to submitting formal plans. Issues ranged from seismic reinforcement, energy codes and A.D.Aaccess to health and safety, traffic patterns, parking and elevator upgrades. 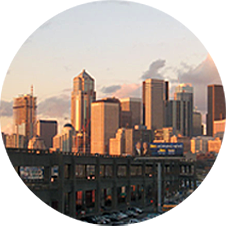 After fending off challenges from The Port of Seattle and Burlington Northern Railroad, interior demolition started in May 1995. Over 45 tons of debris, pipe and electrical conduit were removed from the top two floors of the building prior to the start of construction in November 1995. Crews refinished 25,000 square feet of the original maple flooring producing 3 tons of sawdust. 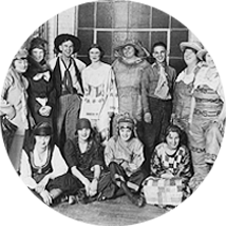 In addition to his own crew Huchthausen assembled a group of 18 subcontractors. Fifty workers spent six months six months building out 60,000 square feet of live / work space on the top two floors, making the Bemis Building one of the largest professional artist developments in Seattle. Tenants include architects, graphic designers, sculptors, painters, photographers, and other artists working in a wide variety of media. The multi-million dollar project includes over a mile of 12 to 17 foot high fully insulated interior walls, a new 30,000 square foot insulated roof, new elevator, 2500 amp 3 phase electrical service, full disability access, and substantial seismic upgrades. I try to capture the beauty that forms when the unyielding structures of society meet the chaos and entropy of evolution. 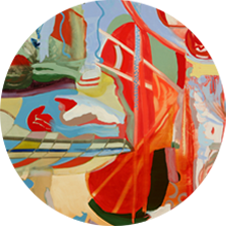 “I strive to challenge the viewer through Contiguous Fractured Abstraction. It may be through the usage of familiar ideas, themes and images or by creating an intellectual scavenger hunt. Established in 1986, Broderick Architects is committed to developing practical, value-oriented designs. The firm consists of three licensed architects, three intern architects, and one interior designer. Our portfolio consists of numerous commercial, ecclesiastic, retail, and museum, multifamily and single family projects throughout the Northwest. Photographer Derek Blagg's portraits challenge the perceptions we have of ourselves. He illustrates fictional moments in time. No less true than reality. Richard Royal is Seattle glass artist with 30+ years experience in blown and hot sculpted glass sculpture. Numerous works will be displayed from several of his most popular series, along with new works from his brand new hot sculpted and mold blown series. 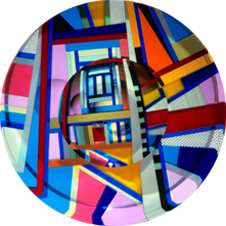 David Huchthausen is an Internationally recognized artist working in glass. His sculpture is included in the permanent collections of 65 major museums worldwide. "Modern Conscience specializes in expert restorations of mid-century furniture as well as finely crafted new furniture inspired by the same period and a functional aesthetic." "Amanda Hallberg channels her obsessions with the intricacies of the built world into her photography." The resident artists of the Bemis Building have reestablished our semi-annual Art Exhibitions. 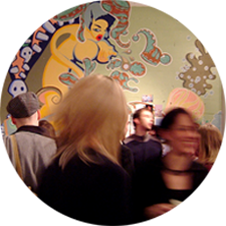 This is a unique opportunity to mingle with the artists in their natural habitat and enjoy a wide variety of painting, sculpture, photography, glass, performance art, fashion design and live music. 16 studios opened up for our spring 2009 show, joined by 25 guest artists who exhibited throughout the building. Many studios also open for First Thursday events. If you would like to have your work considered for future shows, please send current digital images to info@bemisarts.com. 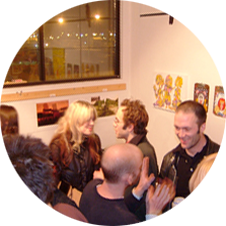 The historic Bemis Building is one of the largest Live/Work studio buildings in the city, and occupies a unique niche in the Seattle art scene. 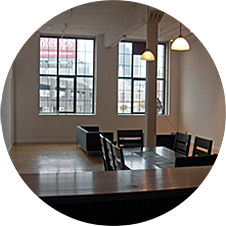 Spacious Live/Work studios with large windows and high ceilings, full kitchen and bath, freight elevator, steam heat, hardwood floors and parking included. New work-only spaces added to the second floor offer Artists a chance to work in this unique building with many of the same amenities as the Live / Work studios. Click here for information on Available Studios.